Colors are starting to turn in the higher areas of the Carolina Mountains. 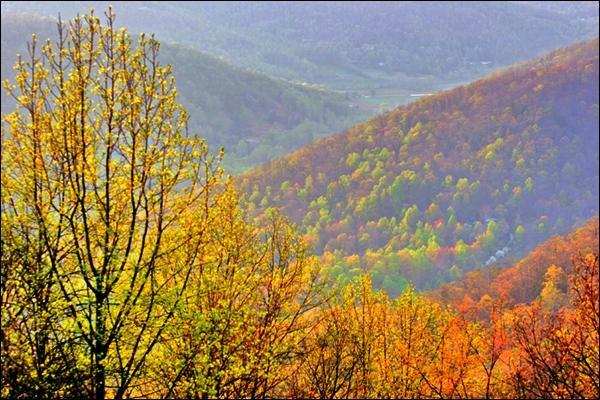 The US Forest Service has launched a Leaf Viewing in Western North Carolina webpage for 2012 featuring scenic drives and areas in the Nantahala and Pisgah National Forests for enjoying fall foliage. Visitors to the site will see pictures and get directions to enjoy the kaleidoscope of glorious leaf colors North Carolina has to offer. Leaf Viewing in Western North Carolina describes the types of mountain trees that visitors will see during peak season at high, middle and low elevations. For example, the Cherohala Skyway in Graham County enables travelers to enjoy a variety of colorful, high-elevation trees in late September.